Our friends over at House of Creatives are getting ready for their Inaugural Music Festival and for the first one they got some major star power! I'm particularly psyched for Flaming Lips who I don't think have ever played South Florida before (at least that I could remember). 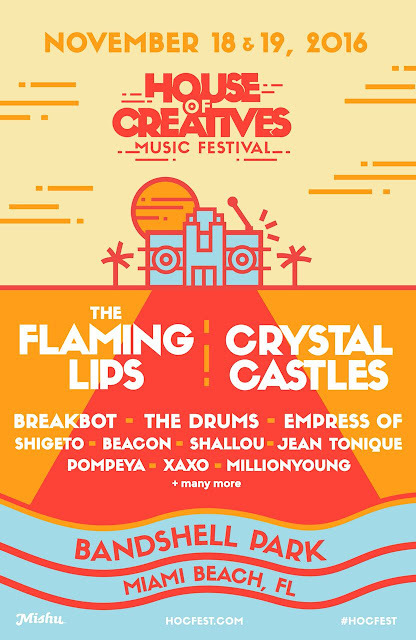 Also on the bill are Crystal Castles (with a new singer), Breakbot, The Drums, Empress Of, Pompeya and many more. Pretty excited for this! Early bird passes for both days go on sale Friday, Oct the 7th for $99 and can be purchased here. Highly recommend you pick those up asap as I'm not sure how many will be available, and this is one festival you're not gonna wanna miss!